Are you a college student or know a student interested in participating in our Summer Workshop Series? Good News! We are offering a special discount for students- 25% off workshop tuition. Use discount code student25 when registering on EventBrite. Or call 828-285-0210. The Center for Craft, Creativity & Design (CCCD) is pleased to announce the 10th Windgate Museum Internship call for applications. 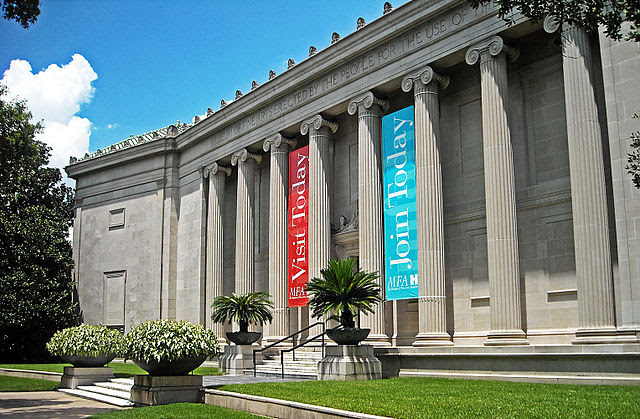 This opportunity provides $5,000 stipends to four nationally selected undergraduate or graduate students to work under the direction of curators or directors in decorative arts or contemporary craft collections, exhibitions and/or programs. The goal of these internships is to support and expand the number of future curators with education and interest in contemporary craft. High Museum of Art, Maryland Institute College of Art (Decker Gallery), The Milwaukee Art Museum, The Museum of Fine Arts, Houston. Please see the internship descriptions for deadlines and application instructions. If you are interested in finding your voice in form and surface and pushing your work beyond the wheel join Deb Schwartzkopf from May 25th-29th at Odyssey Clayworks. Through the magic of instagram, I've met John Goddard, who has done a ton of experimentation with Egyptian faience, aka Egyptian paste. 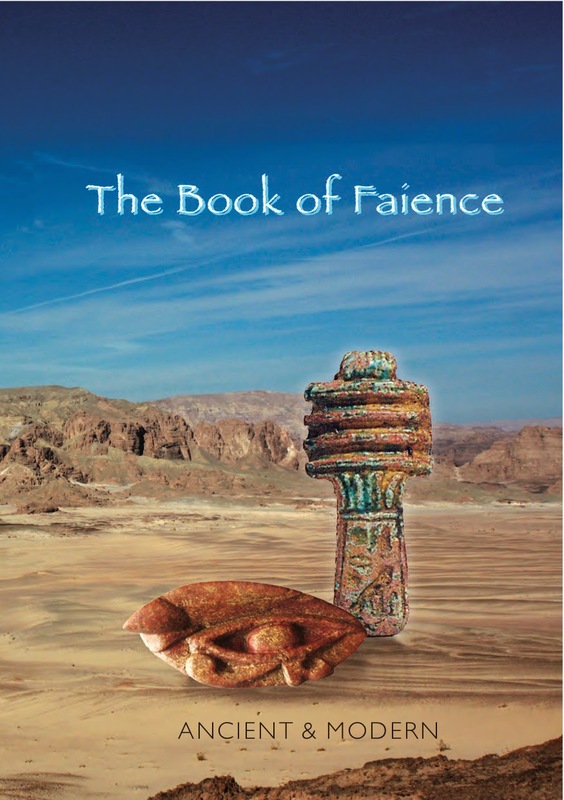 If you're interested in working with Egyptian faience, check out his downloadable book, "The Book of Faience." It has lots of information, including recipes and firing schedules, and beautiful photos to boot. He says he's happy to answer questions - you can contact him at john@goddard.eu.com. Free & OPen! 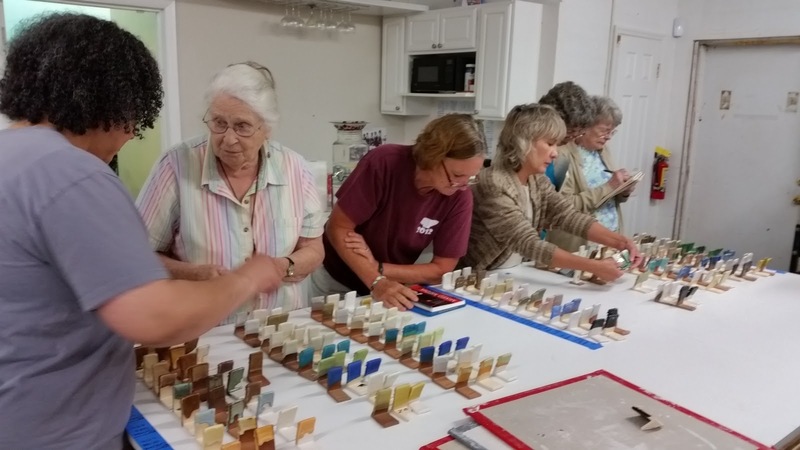 Haywood Clay Workshop with Susan Feagin! Monday 3/30! FREE & OPEN TO ALL! Demo Workshop with Susan Feagin! Monday, March 30, 2015 1pm - 4PM at HCC! Susan is the Clay Coordinator at Penland School. She'll be demonstrating her various approached to surface design treatment. Free and open to all -- Please join us! Call Terry Gess at 828 565 4159 or email tgess@haywood.edu for more info. Fourteen(14"x28") kiln shelves for sale. Fired to cone 05. No warpage, no kiln wash, only a few drips on one shelf. Selling for less than half new price. $350 for all 14 or sold individually. I have a new article entitled "Is it Food Safe?" 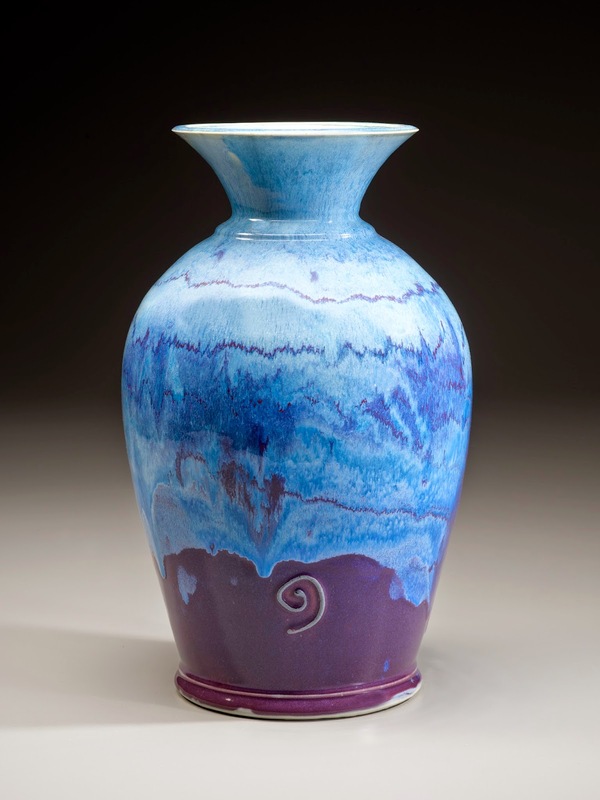 which tries to address the many questions and confusions regarding ceramic glazes. I also include tips on studio safety. 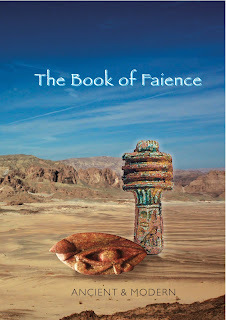 I am selling as a PDF (electronic file) on my site for $0.99 for 3 days and then for $1.99. 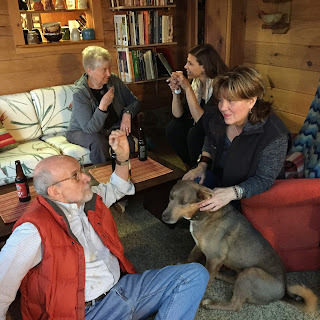 Looking for a house rental or house sit opportunity near Spruce Pine from late May to early August 2015. My partner will be teaching at the Spruce Pine Montessori School this summer and I am looking for a clay studio to share/use during that time to continue my work. 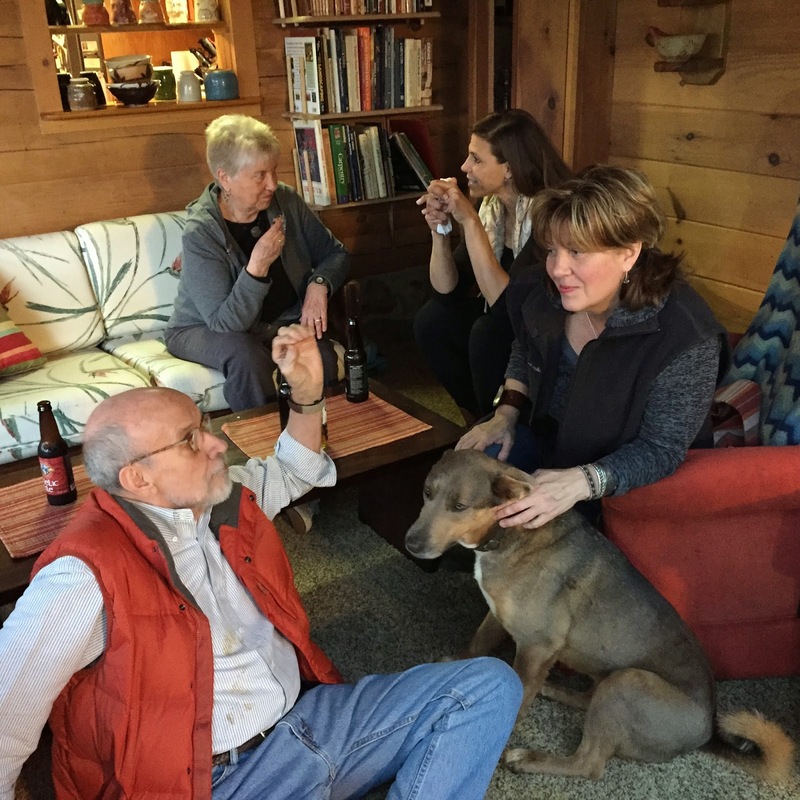 We are both responsible home owners in our late 50's and looking to enjoy the summer in the mountains while continuing our livelihoods. 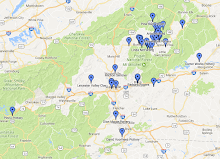 I saw a 2013 and 2014 post on Clay Club for a house and studio for rent near Penland. I am wondering if it might be available for rent again this summer. Any information or leads would be appreciated. There are just a few days left to enroll in Odyssey's spring classes! I will be teaching an intro to surface design class this session. I only offer this class about once a year and it is always great fun. There are just a couple of spots left! 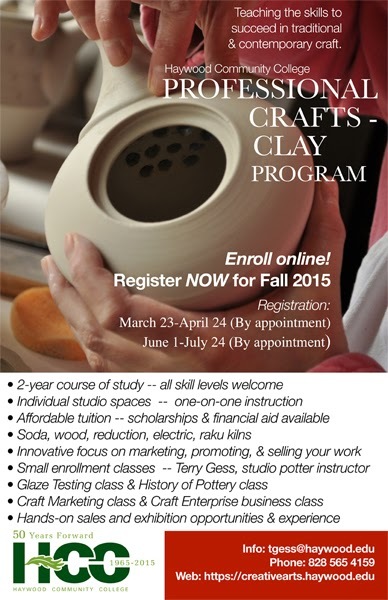 Looking for a solid education in clay? Want to develop the skills to be a successful studio potter? Want to take your work to the next level? Professional Crafts - Clay Program! 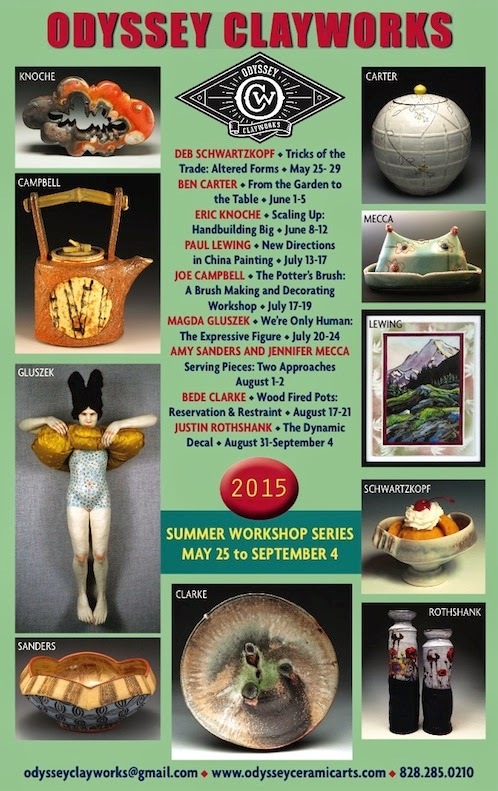 We have a few spots open in this Glaze Workshop at Saratoga Clay Art Center in Saratoga NY April 10-12, 2015. This will be a great workshop because we are doing glaze mixing and testing in both Electric oxidation and Gas reduction at cone 6. If you are at all interested in cone 6 glazes this will be a great workshop where we will have over 1200 tiles to discuss the properties of glazes. This workshop is actually similar to a week long workshop at most places but you get it in three fun filled days. We will also go over the book "The Complete Guide to Mid-Range Glazes" so you get a better understanding of glazes, firing, application and mixing. If you are in the NY area or know anyone who is interested - could you pass this on?! This is a three day Cone 6 glaze testing workshop designed to show participants how to test a base recipe and get various colors (color blend) as well as strength of colors (progression test). It will also be a general overview of ceramic glazes, focusing on but not limited to cone 6 glazes. We will discuss clays, slips, cones, kilns, firing dynamics and principles as well as applying those principles to various firing cycles. 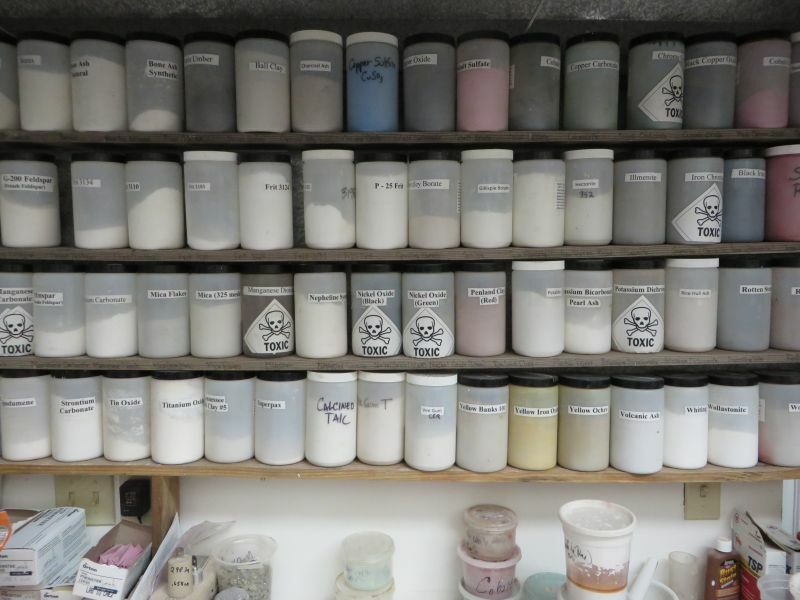 This will lead us into some basic classifications of glazes, like ash, celadon, temmoku, etc. We will discuss how and why each type of glaze works and how you can achieve them, how to adjust your glazes and how to find new ones. We will discuss glazes from John’s new book: “The Complete Guide to Mid-Range Glazes: Glazing and Firing at cone 4 – 7”, but will go into more detail than the book allowed. 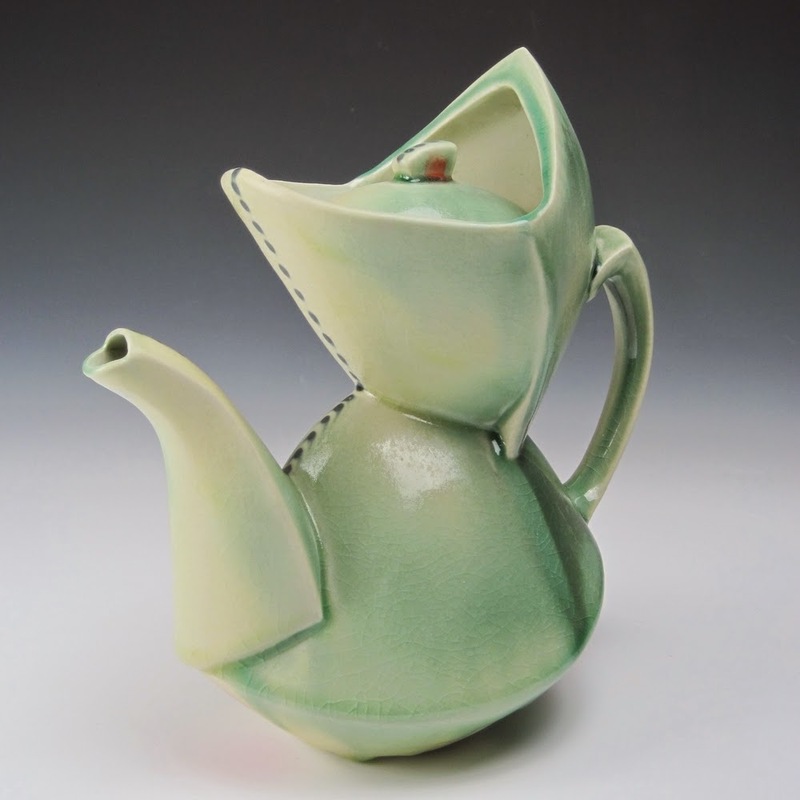 The workshop is for beginner to advanced ceramic artists and is limited to 20 participants. Additional kiln parts, elements, kiln shelves, hand tools, brushes, cones, commercial glazes, spray gun, molds. Photos are clearer and large at the link below. Potters, Gardeners, Pets Need Help? The Perfect Assistance is Here! I'm posting this for my assistant, Sarah Holt. Jump on it now! Thanks from Gay Smith. My name is Sarah Holt,and I am looking for work to support myself. 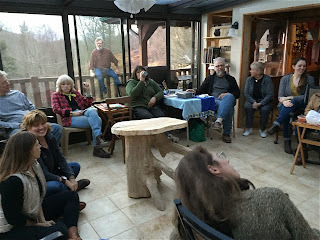 I have over 10 years of clay experience, and I can mix glazes, mix clay, process reclaim, clean your studio, help with chopping/stacking wood, scrape kiln shelves, put in a shift on a wood firing, do yard/garden work, clean/prep rental properties. I'm good with dogs, and can do dog/house sitting. I am also a good cook, so if you want someone to make the nibbles for a studio open house, I can do that too! I can provide local references, and I have my own transportation. I will be available starting immediately. 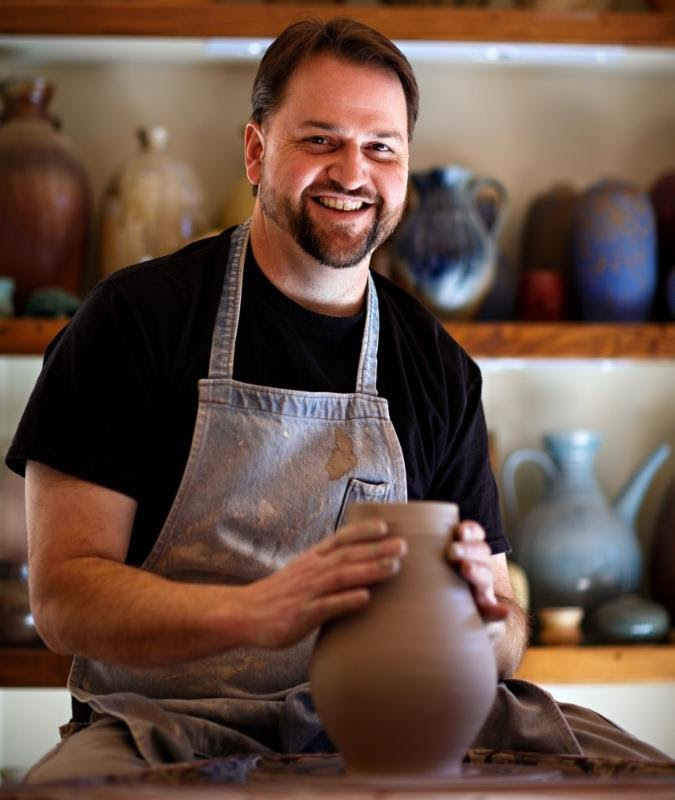 Great Job Opportunity for Ceramicists in Burnsville, NC! Great Job Opportunity for Ceramicists! We are looking for potters for a brand new enterprise in the Burnsville, NC area involving multiple production lines using various techniques and processes. Contact Andy at apalmer@crimsonlaurelgallery.com for more information. See the facebook post here. 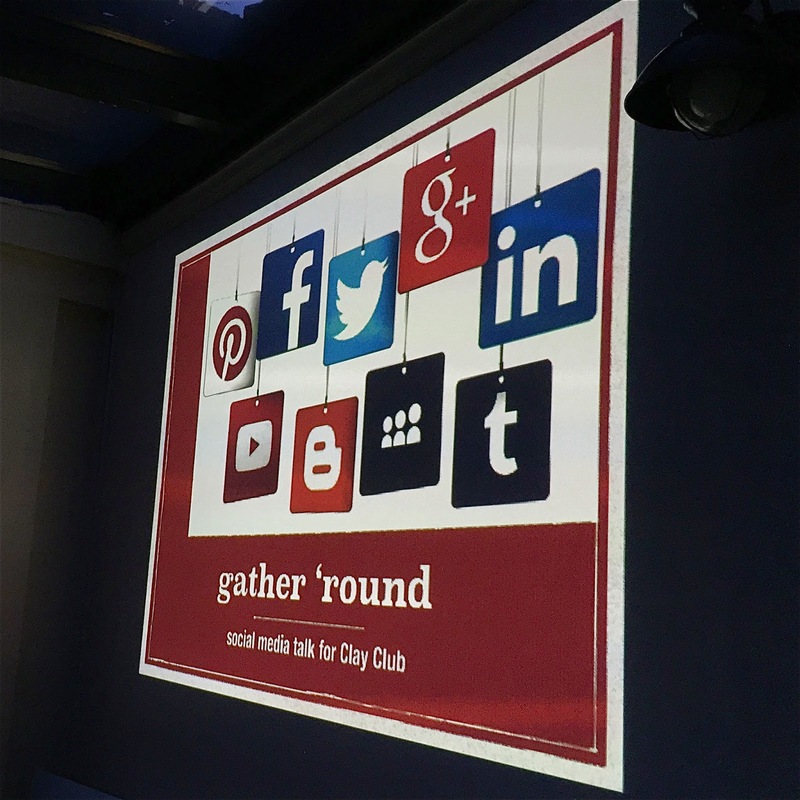 Thanks to John Ferlazzo for hosting Clay Club last night and to Michael Kline for leading a terrific demo and discussion on social media for potters and ceramic artists. 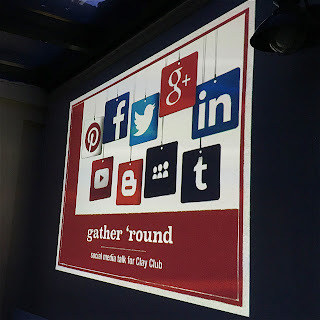 And thanks to everyone who came and participated, too - lots of good questions got asked and answered. Thanks for a great Clay Club everyone! 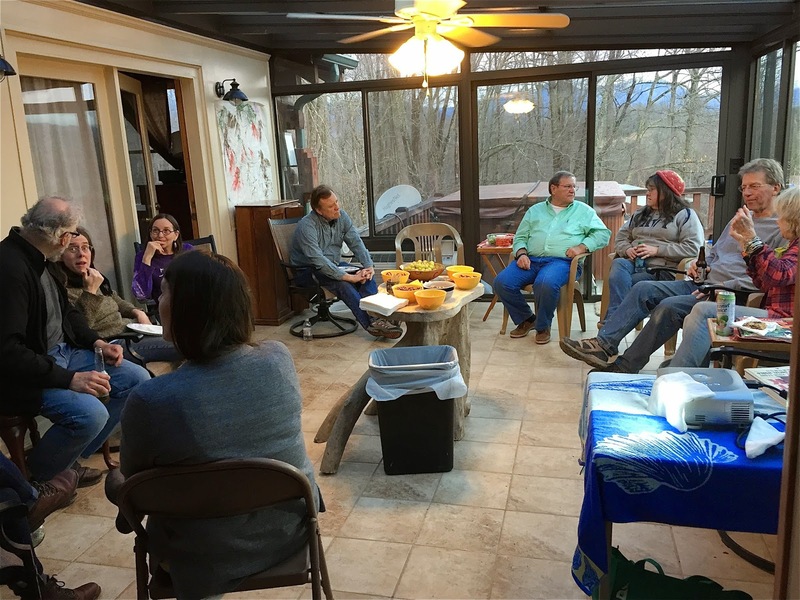 I am a studio manager working to get my studio in Boone, NC up and running with more equipment to offer large classes and workshops. Also looking for materials to start my own clay studio. Looking for wheels, kilns, extruder, slab roller, any & all used clay related tools. 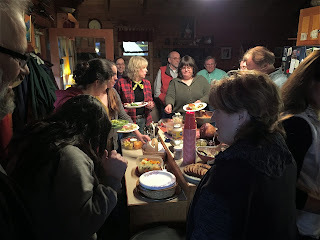 John will provide a spiral-cut ham and we will have the usual potluck to go with that, so bring food to share. Clay Club is BYOB, so bring drink, too. Full Time potter moving to Asheville. I am searching for a studio space to rent on my own or share with another potter. I will be working full time in the studio, am clean and organized. I have three kilns, potters wheel, slab roller, extruder, as well as full shelving units and work tables. If sharing a studio space I am willing to share equipment in exchange for share in rent or open to other negotiations. Looking to purchase used equipment for a home studio: automated electric kiln, gas kiln, slab roller, wheel. Thanks! Jillian Wolf bisoncrow@gmail.com, 828-778-1874. We’ll be hosting a closing reception for Roger tomorrow evening at Art Center West and a demonstration workshop throughout the weekend. lease feel free to send word to students and friends. I hope you enjoy the exhibition online or in person at 1355 Woodstock Rd, Roswell GA 30075. 770.641.3990. I'm looking for someone who would be interested in firing cone 6 reduction with me. I would like to fire about every 3-4 weeks. The kiln is located in West Asheville and is a 60 cubic foot gas car kiln. Please reply by email to westfirestudio@gmail.com. John is going to provide a spiral-cut ham and we will have the usual potluck to go with that, so bring food to share. Clay Club is BYOB, so bring drink, too. John has a kitchen in the space where we'll be meeting, so if you want to bring something that needs to be heated, that's doable. John also says he'll have what he is calling a "campfire+." John is at 110 Gage Branch Road, near Bakersville. Coming from Spruce Pine, drive north on NC 226 (toward Bakersville) for approximately 6.5 miles. Turn left onto Mine Creek Road/NC 226A. Go 2.8 miles and turn left onto Gage Branch Road. John's is the first driveway on the right. Follow the driveway up to the top. Questions? Call John at 828-688-1354. You can also contact me by email (amy@amywallerpottery.com) or at 828-467-1183. 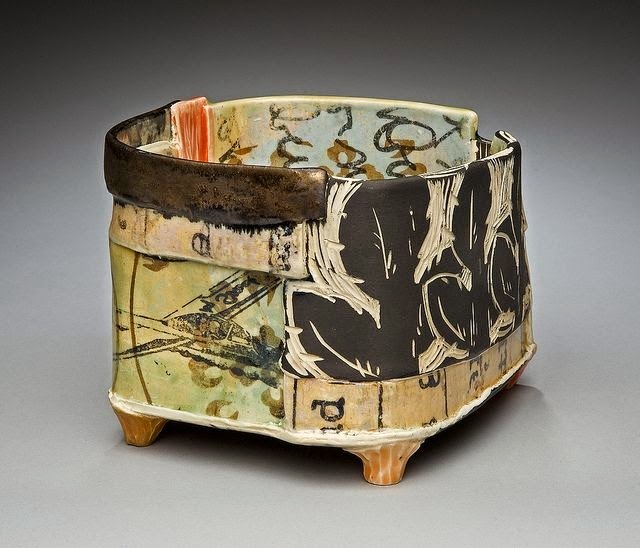 "Turning with Tradition: Keeping the NC Pottery Tradition alive through Contemporary Works"
Thursday, Mar. 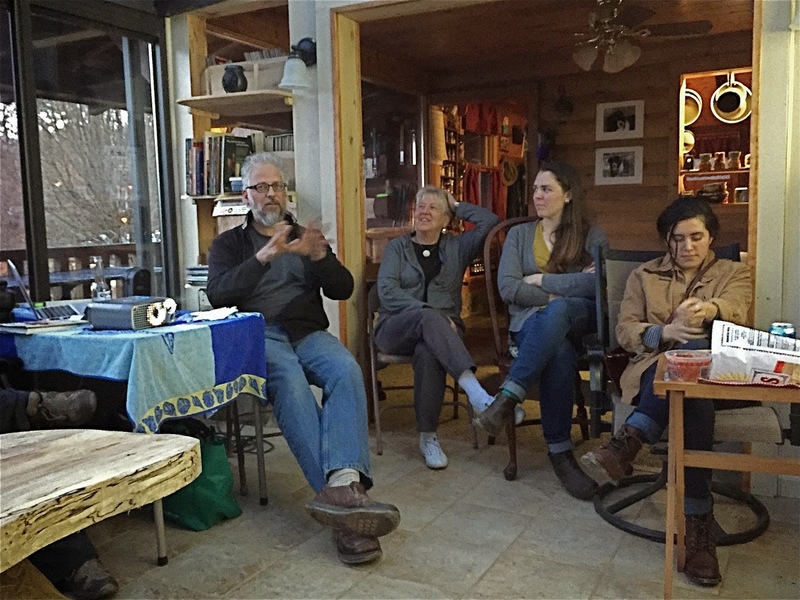 19, 2015 at 7 p.m.: American studio potter Ben Owen III, who works in Seagrove, N.C., he will speak on the Seagrove tradition. All lectures are free and open to the public; they start at 7 pm and will held at the CVCC East Wing Auditorium. Do you want to increase the scale of your work, but feel intimidated by large pieces of clay? The truth is, you don't have to be a big, strong person to make big, strong pots! Join Anja and Gabriel as they demystify the techniques used to produce large scale pottery. Demos will include throwing wide rimmed bowls, section building skyscraper pitchers, centering 50-100 lbs of clay and creative ways to make voluminous storage jars. These techniques are simple, fun, and easy to learn. You'll be amazed at the pieces you create! The weekend will include plenty of studio time in addition to the demos. For more information, please visit odysseyceramicarts.com or call 828-285-0210. 7 foot tall, light grey, includes hardware. They look like this. (2) Pro Panel Desk Unit 36" tall, dark grey. They look like this. Some small blemishes, overall good condition. These were used by my mom, Bobby Wells, for showing her art at craft fairs. I thought I would be doing the same, but alas, the farm business has me fully occupied.